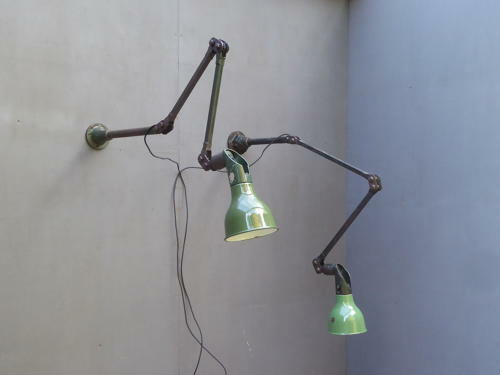 A near pair original vintage industrial Mek Elek machinist lamps. A fantastic pair of Mek Elek lamps in original paintwork with a fantastic patina & boasting the usual exceptional Mek Elek build quality. With green & white enamel shades and cast iron bases, the lamps can be used as a wall or table lamps & come rewired in twisted black flex. Priced per lamp with two available. Wear commensurate with age, good overall with favourably worn, clean to the touch paintwork, acceptable wear & chipping to the shades. The lamps have slightly different baseplates & the lower arms (arm which leaves the base) differ in length slightly. Flat out, the lamps measure 133cm & 137cm in length, the lower, rigid arms measure 32cm & 39cm to the first joint respectively. Electrical items should always be be checked and / or installed by a qualified electrician.